It has been so long since I last posted, I almost wondered whether I might have forgotten how to use WordPress. So far, so good. I’m here. I’m writing. And it feels good. I’m currently in the midst of a week of reflection. As I approach the big 30, I am looking back at my 20s in wondrous amazement of everything that has happened in the last decade. I’m not here to dwell on the negative, I am here to celebrate the positive. I arrived back in London in March after a year and a half hiatus, following an awful break up and a very unsettling thrust into abnormality. I am extremely happy to say, however, that after three and a half years, the enthusiasm and passion for life that I once had has returned. 2016 has been an odd year. And I’m pretty sure I’m not the only one to say that. I just had the added bonus of unsettling myself and moving back to a big city that is hard to settle in on top of everything else. As we near the end of a year that I could only describe as bilious, I enter a new chapter of my life and (hopefully) a brand new fresh year to look forward to. Right now I’m single. How does that make me feel? Well, society tells me that I should be stooped over and crying myself to sleep at night because I don’t have someone to love and, more importantly, no one loves me. But I couldn’t be further from that in reality. When I split from my ex, he commented on my inability to be alone. I needed people – to feel safe, to feel loved, to feel happy. But the longer you spend alone, taking the time to do things for yourself, being forced to make decisions of your own, the easier (and better) it becomes. I haven’t been this happy in years and I hope to god that this feeling doesn’t leave me just yet. Sure enough, I am having my fair share of dates. But the longer I am single, the less bothered I am about using one of the vacuous dating apps out there. Luke – you were a self centered posh git, Nicholas – I liken you to a very past its sell by date Duracell Bunny, Patrick – you have some issues you need to sort out… the list goes on. I don’t doubt they all have something to say about me, but a dating app can cause psychological instability when meeting with a potential suitor. I’m not saying I’ll never use one again, but I can pretty much guarantee that the person I end up with will not have been swiped. Next year I am running the London marathon. I never thought I would be a runner. I hated cross country at school and was sick at the end of races. When my ex boyfriend wanted to go for a run, I would laugh in his face and say ‘maybe next time’. But here I am. I have found it to be incredibly theraputic and as soon as I started, the majority of my anxiety vanished into thin air. I am going to make an effort to post more about my training runs, as well as the food that I have been eating in the run up to one of the craziest days of my life, no doubt. 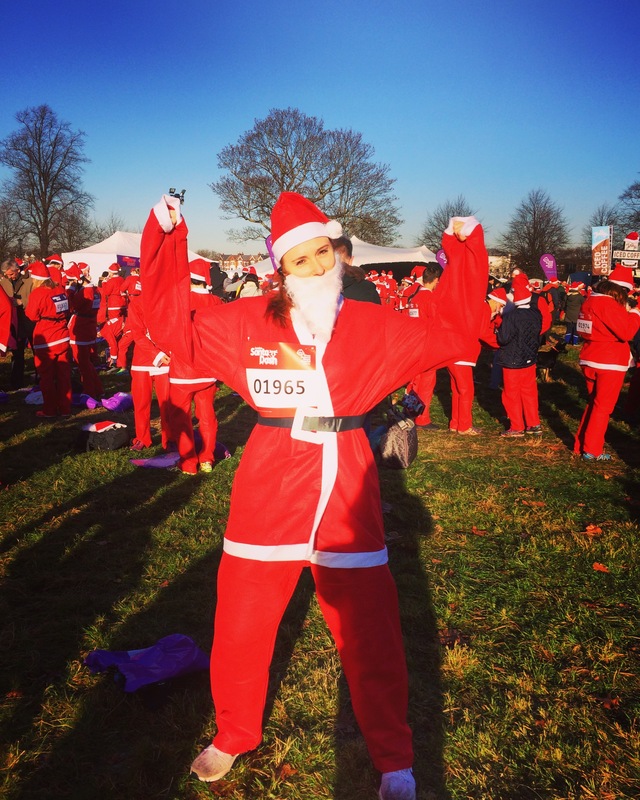 For now, there’s a picture above of me dressed as Santa Claus from yesterday’s Santa Dash in Clapham Common. I’m going to be saying this a lot over the coming months, but if you feel like donating for a VERY good cause, please head to my Virgin Money Giving page. Yay, I got a ballot place in the marathon so I’ll be running it too! Nice insightful post. I turned 35 this year and feel like I know myself better than ever.